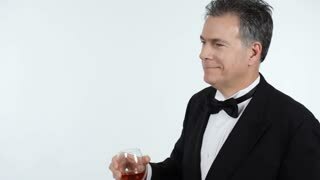 Search Results for "well dressed man"
Mature man using smart phone while adding ice cubes to his whiskey. Cropped shot of a mature well dressed man relaxing at the bar, browsing online while having whiskey. Technology concept. Middle-aged man giving Christmas gift boxes. Well-dressed man with gift boxes on blue Christmas bokeh background. Happy winter holidays. 1920s: Venice St. Marks Square with well-dressed man and two boys surrounded by pigeons. Man feeds the pigeons. Man takes off his hat and tries to shoo the pigeons away. View of the city from San Marco Campanile. Close up portrait of a serious man holding a tablet and writing on the shore. Stylish well-dressed man working. Handsome well-dressed man stands by bookshelves in a room with classic interior. Man with a long beard. Hypnoglasses smile adjusting necktie. A scene in the eyeglasses of a smiling old man: a well-dressed man adjusting his bow-tie. Man adjusting necktie. A well-dressed man adjusting his bow-tie. Comic Frame Man Adjusting Necktie. Inside a panel from a comic book page layout: a well-dressed man adjusting his bow-tie. Vhs Man Adjusting Necktie. Fake VHS tape: a well-dressed man adjusting his bow-tie. 1950s: Father Keller stands behind high-backed chair, speaks earnestly and points at the people. A well-dressed man on the couch raises his hand to volunteer. 1950s: Well-dressed man and two women listen intently on couch. Father Keller continues telling his story. Lonely well-dressed man with beard is walking alone across the beach in winter. He is looking at the horizon. A well dressed man walks up stairs and heads out the door in the morning. No necktie allowed. A big red stop sign appears on a scene: a well-dressed man adjusting his bow-tie. Well-dressed man skipping rocks on a river in the city. Slow motion, over the shoulder. 1960s: Well-dressed man and woman perch on living room furniture sipping coffee. Dog runs through living room. Young boy closes curtains and sits talking with parents. Handsome well-dressed man stands by bookshelves in a room with classic interior. Women stop and look at a well dressed man walking down the street.